Just wanted to post a quick and easy card using the Wanted set. I was able to use my scallop punch and punch out the "medallion" perfectly. 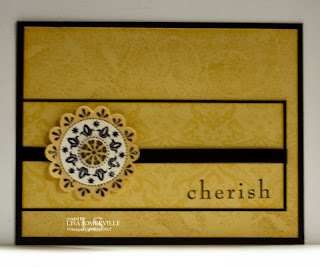 The medallion is also great for using the other SU punches to created a great layered look, as shown on this card. That is just gorgeous! Thanks for the tip on the punch -- I have both these things, and my punch is still working (my fingers are crossed...) Thanks for the inspiration! Awesome card Lisa! Love it and the punch. Great job as always. This is absolutely GORGEOUS. Great color combo.